You can pick up the BB-8 2-in-1 Mega Playset on Amazon today for $83 as their Deal of the Day. ← LEGO Star Wars On Sale At Amazon.com! UPDATE: BB-8 2-In-1 Mega Playset $119 At TARGET.com! Here is another great deal! 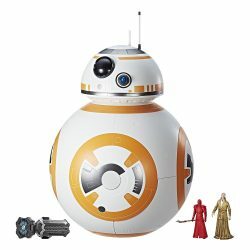 The BB-8 2-In-1 Mega Playset is marked down to $139.99 at TARGET.com, however, today only, you get 15% off and the item ships for FREE. Special thanks to JTA reader Sean. C. for the news! If you need some prompting on whether to pick up this fun set, then be sure to check out our RDR on it RIGHT HERE. UPDATE: It’s also the same price on Amazon.com as well.